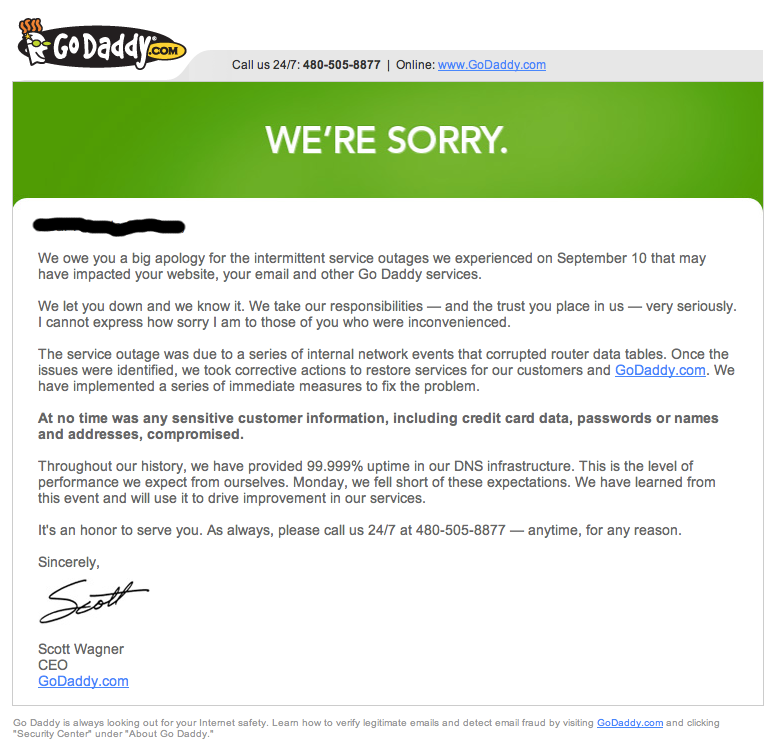 Five days after one of their worst outages which happened on September 10 impacting thousands of websites, GoDaddy sent an apology to all its customers explaining the reasons for this outage. Some websites were down because they are hosting their site at GoDaddy but companies that only had their DNS hosted at GoDaddy were also affected by this outage. There were also rumors about a member of Anonymous known as AnonymousOwn3r claiming responsibility for the outage. The point here is that GoDaddy suffered an outage that lasted several hours and GoDaddy confirmed that this was due to corrupted data tables and not some sort of attack, and at the same time they assured their customers that not sensitive data was ever compromised. A service outage is something that any company suffers at one point or another, one piece of advice is to try to have your site and DNS hosted at different places, this can help if your hosting provider goes down for a long period of time, at least you’ll have the option to redirect your domain name to another hosting provider that contains your website files.